Just wanted to send some "before and after" photos....I am extremely pleased with the liquid rubber. Great product so far. Appreciate the consideration for the gift card. Just making good on my promise you said we would get a $25.00 AMEX gift certificate if we write something about the product. Well I would have done it for free but thanks for the $25.00. So for the past 7 months we kept seeing our waterline go down. We went to two pond shops and tried the crap they had there and nothing worked. Skeptical at this point your sales people really did not try to sell be but rather tell me about the product and why it would work. I really never knew there was a liquid version of the EPDM pond liners. Well it has been about three weeks and the level for the first time is holding. I wanted to make sure before I wrote this but in the past we knew within a few days that the other products did not work. I am sorry I am reaching out to you so late after using your product! I never did take any good footage of applying the EPDM liner due to a rushed job but have told many other companies about the product and will stand behind it one hundred percent. It worked great for our application and was easy to use. Once again I am sorry for not getting any footage but I hope to continue to use your product in the future. I'm just writting to say Thank you, I've receive th material on Sept the 2nd and I was very please with the product,. It arrived intact and I've started to apply it on my 5th wheeler roof. It is a thick paint but the coverage is amazing, I am very satisfied with the results. I would like to thank the gentlemen who help me with my order, I can't remember is name but he was very helpful. I understand that delivery to Victoria,BC Canada was not the easiest thing but it when through, I am very ecstatic that it did. Your product do not required a primer and it is less toxic then the products made available to me, I will recommend your product to a lot of people. 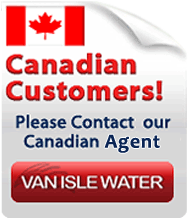 If you send me your business card, I can post it here at Fort Victoria RV Park. I put on the rest of the liquid roof and it turned out really well. I am very pleased with how it turned out-should have no worries about any roof leaks in the for seeable future. I think your product is amazing. I will not let a poor conditioned roof on an RV keep me from buying it, as I know of an easy solution, that I can do. This is my first RV. 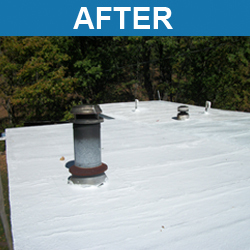 I have never coated an RV roof before, and having a shop do it seemed too expensive. Your product is not cheap, but I put a gallon on the edges and cut in the roof vents last weekend, so I got another 4 gallons today to do the rest this weekend. It has not been hard, I am hoping the longevity of the product will produce as advertised. 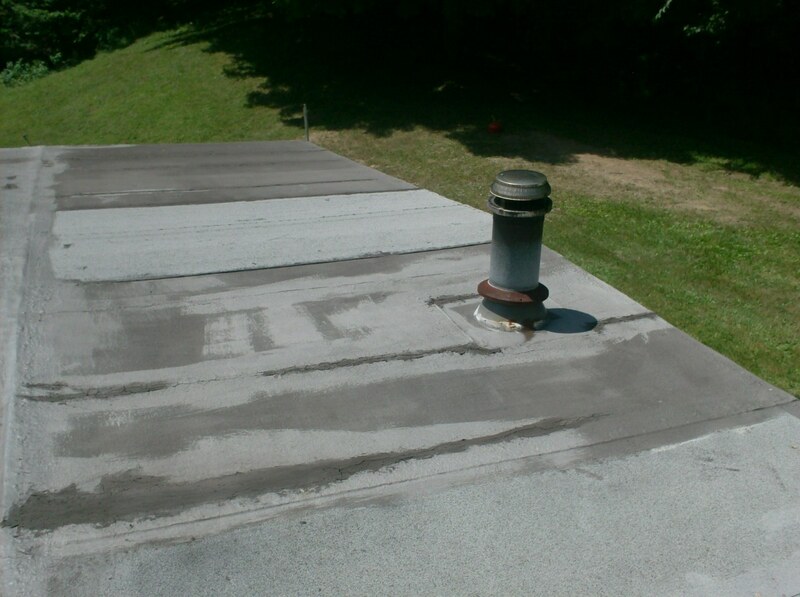 I have told some of my RV friends about it and now they seem interested when they go to seal their roofs. Your videos on your sight really helped me decide, along with your responses to my email questions. One coat vs a primer and top coat was also attractive. Hi Kellie! Thanks for your quick response to my questions. Yes, please feel free to use my comments on your website. We will let you know next year how the Liquid Roof has held up to our -40 degree temperature Canadian winter! So far its done its job and has sealed up the pinholes in the RV metal roof and the inside is as dry as Sahara sand storm !! No more water leaks! 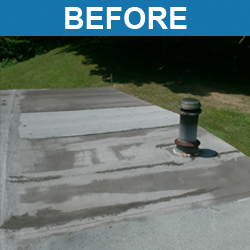 We had an opportunity to apply your Liquid Roof product on the metal roof of our RV this weekend. 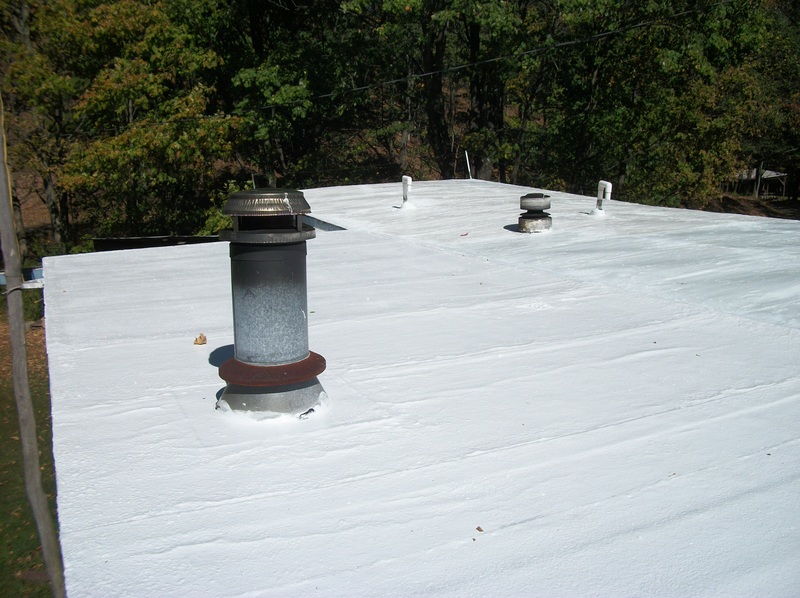 I am very happy with the ease of application and the final smooth look of the roof once the self leveling and curing process began. When I first started applying the liquid roof product, being this was the first time I have used it, I was a bit concerned about running out of product and may have applied it a little too thinly. But as I used it more, I got used to how the product felt as it went on etc, and started to be more liberal in its application. These sections of roof look smooth and even. Where I may have been a little stingy in the amount of product I used looks not as smooth as the other areas. So, my question is: -can I apply a second coat of Liquid Roof to this area to get it to match the smoothness of the other areas?? If it is possible to do it, what prep work and steps do I need to take?? 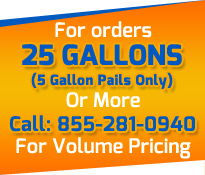 We do have about a gallon of product left over from the large pail we ordered. We put this remainder in our deep freeze to stop the curing process. Was this an OK thing to do and should the product still be OK to use? Sure you can use our comments. We used your product and loved it. You can add that we paid two grand to have the sliders caulked and they still leaked before using your product!! Took all the old caulk out and actually put the liquid roof in a 60ml syringe catheter tip and used it to pour a bead over the seam as it is hard to reach under the roof. We also found the leak was coming from the middle seam of the roof so all the caulk in the world would not have fixed it. We just ordered seven more gallons to paint the aluminum roof of the vehicle to keep heat out. The elastomeric paint we got from Lowes peeled off the first time we took the truck on the freeway. I want to let you and anyone reading this know of my experience with Liquid Roof. I'll tell you the end of the story and then go from there; FANTASTIC PRODUCT!!! (end of story!). I was pulling out of an RV slot that was a "pull thru" and found it wasn't quite a "pull thru!" The bubble/sky light over my shower was hit by a tree and while the bubble didn't break it did crack around the base. I attempted an unsuccessful repair and found it leaked terribly. I googled and searched for a fix and found EPDM Coatings.com. I was really skeptical and was honestly concerned that I would pay for a product and it either wouldn't work or I'd screw it up! Neither is true! IT IS SO EASY AND SO GREAT!! I bought a one gallon Liquid Roof kit. I reseated the bubble (did not buy a new one !!) painted Liquid Roof around the entire base, placed the mesh material over the painted part and painted it again with the Liquid Roof. I repaired the rubber roof areas around the bubble that had ripped and then used the remaining gallon to paint every penetration on the roof. We had 2.5 inches of rain in San Antonio in January and NONE of it was in my RV thanks to Liquid Roof. A couple of hints for anyone thinking about doing this; first DO IT!! IT WORKS!! AND IT'S EASY!! Next, before you start get some old clothes on, some rubber gloves and I would tape off the gutters so that it doesn't drip into the gutter. Overall this is a FANTASTIC PRODUCT!!! © Copyright 2019 EPDM Coatings LLC. All Rights Reserved.